Your congregation will enjoy the comedy magic show that just happens to have a message. Your guests will be introduced to the powerful effect of knowing God loves them. AMAZING & AMUSING - As a youth pastor in the mid 80s, Derrel discovered that by showing an illusion would focus the attention of the group to the message being taught. It wasn't long until he was getting involved with other gospel magicians, story tellers and other ministry artists. Not long after, Derrel began performing professionally using his first paid performances to fund a mission trip. MOTIVATION & INSPIRATION - using magical performance as a tool, Derrel combines amazement and art to highlight a message of inspiration. 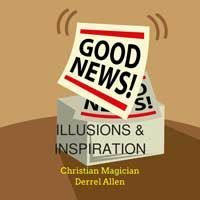 The wonder of magic was a major part of motivating Derrel to seek excellence in performance and in life; a message he shares with his audiences. BRING THEM IN - since magic is becoming a significant factor in many of today's television and movies, it's popularity is a drawing card to those that seek entertainment. Use this as a way to bring the unchurched in. They will be entertained, but they will also hear the message of God's love and Christ's salvation.